45 year old male, was suffering from uncontrolled Type II Diabetes Mellitus and Hypertension with morbid obesity. Living alone in Bahrain, he couldn’t socialize or carry out his job due to all his medical illnesses. His Diabetes progressed to such an extent, that despite insulin and oral hypoglycemic drugs, he developed a severe infection in his left foot, leading to an amputation of 4 of his toes in the left foot, and a large non-healing infected ulcer despite highest possible antibiotics. Tired of all his medical issues, He turned to bariatric surgery for help. Once his wound was cleaned and infection reduced, he underwent a laparoscopic Roux-en-Y Gastric Bypass. The very next day, he saw his sugars lowered. Despite being off insulin, his wound started improving, blood pressure normalizing, and he started losing weight. 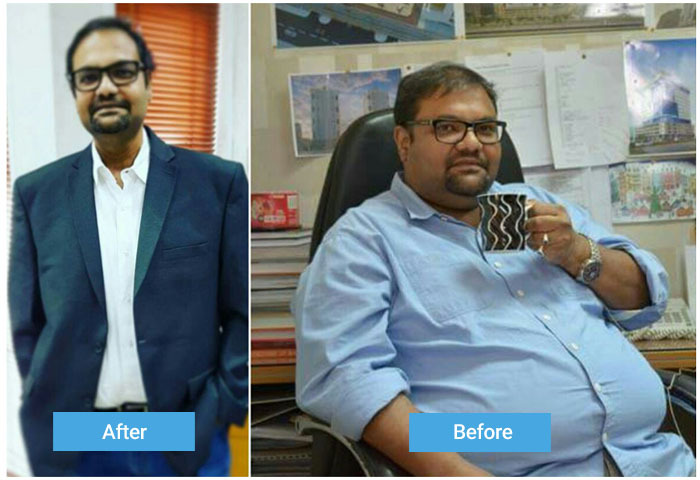 Now, at 3 months after the surgery, He has lost almost 40 kg of his excess body weight. He is off all medicines for his Diabetes and blood pressure, and his foot has healed completely. Now he has returned to his job in Bahrain, healthier and happier.